As long as they don't get worse - that's the secret to every step. Outstanding work and instructional blog! I do not recall Chuwk's trick you showed - glad you reminded us of it. A 1/32 Rufe? A kit or conversion? I don't recall. Atoke - fun topic. Thorpe's books from the 1970s list from Japanese manuals how many layers of the tinted primer went on specific areas of the aircraft. Right now I know where my copy of Japanese Naval Air Force Camouflage and Markings, World War II is but my Army copy is MIA. I look forward to more when you post! 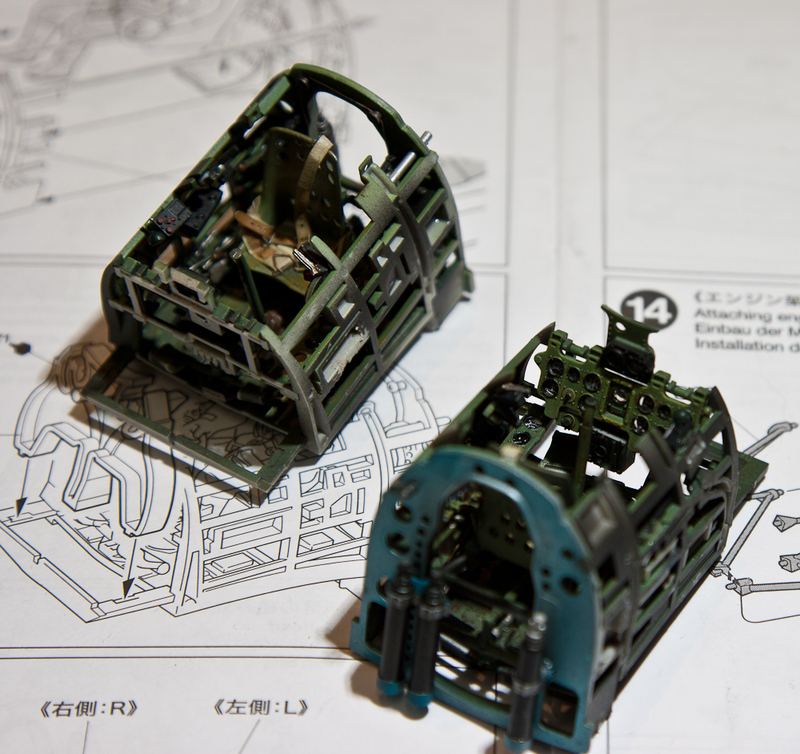 The base kit is Tamiya's A6M2b and the conversion is made by MDC. Tons of new techniques tried here, most of which I have learned from your friend and mine, ChukW. Ignore the seam on the light at the top of the sidewall, I knew it was there but chose to leave it - it wont be visible once the cockpit is assembled. Very nice looking details, Matt. Looking real good. You sure make the most of out 1/32 scale. We've all learned quite a bit from Chuck. Sure glad he's back and working on his Mig 21. Very nice work Matt. 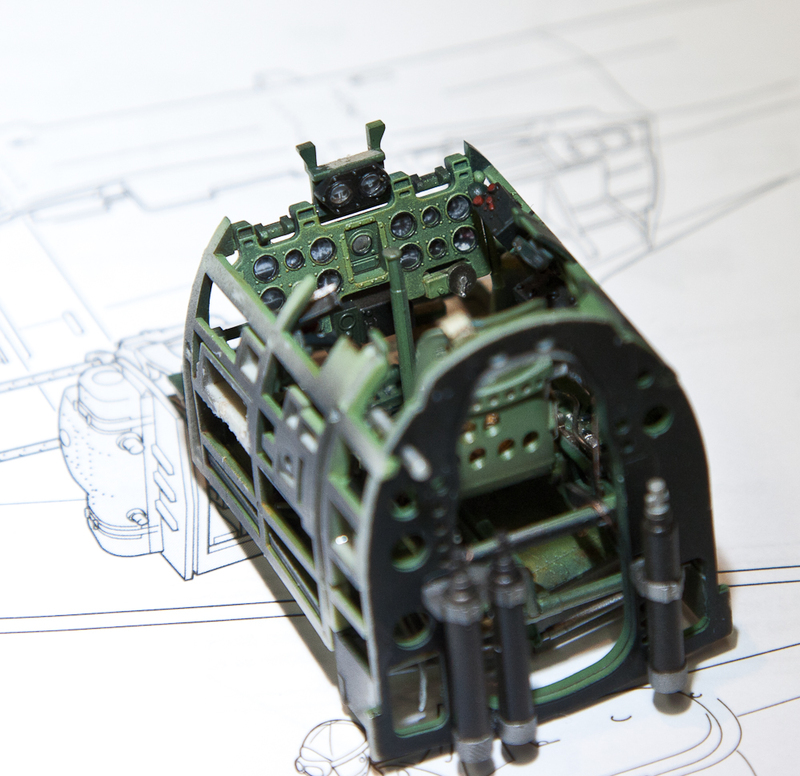 I have been working on my A6M2b for a bit over a week and have finished the engine and the cockpit - I have three weeks off and get to spend a lot of time at the bench, hence the rapid progress. I have taken several photos but I am not sure my skills are up to doing a blog. Again, very, very nice work. Joel - you're bet we're glad. I suspect Chuck is probably pretty glad himself to get some time back in at the table. Ernest, thanks man. You likely don't give yourself enough credit. 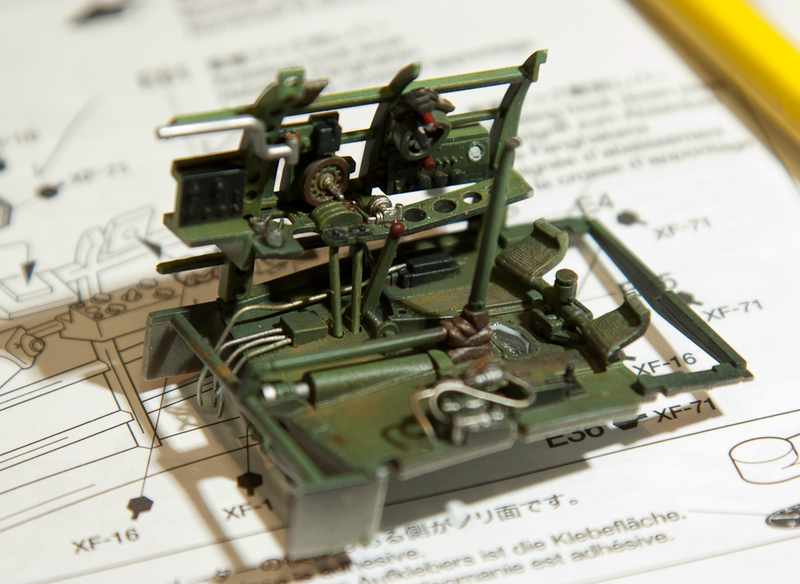 I found that doing these blogs made me a far better modeller, in part because you take a photo of something so small and post it here in such a large format that it quickly leads to your find your weaknesses and correct them. Plus the feedback from you guys is invaluable and it keeps me building. Sorry for the delay folks, the work was done and the photos were taken - it was just a hectic weekend. The cockpits are finally - and officially complete and assembled! 1) - As you saw earlier, I start with a black base. Then I use the Zenithal technique, spraying from the direction of a lightsource, leaving black paint where there are naturally shadows. 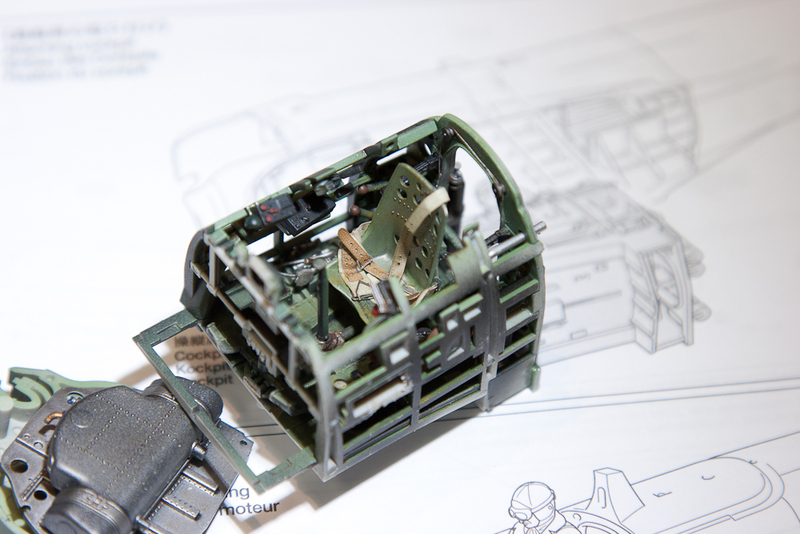 This works on details as small as buttons on a radio, to large details like the cockpit air tube on the right side of the cockpit. 2) - Next, I spray a lightened coat of the base colour in the larger areas in much the same way as you would exterior paint when post-shading. Literally the same technique. 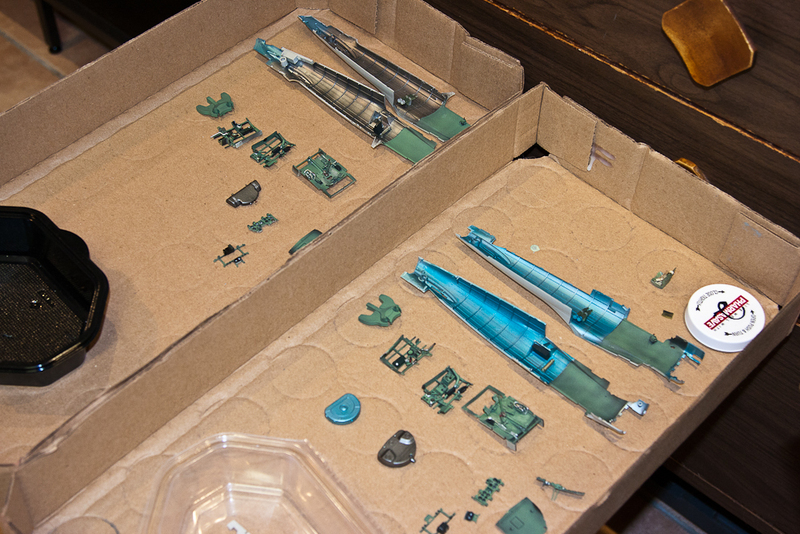 3) - Then I drybrush the raised detail - I'll use either a light grey or a lighter colour than in the past two steps. I pick one, if I don't like it [this is the best thing about painting] I'll just paint over it [drybrushing in this case] until I get the look I want. In this case I just lightened the base colour - to about the same shade as the post shading done in the last step. 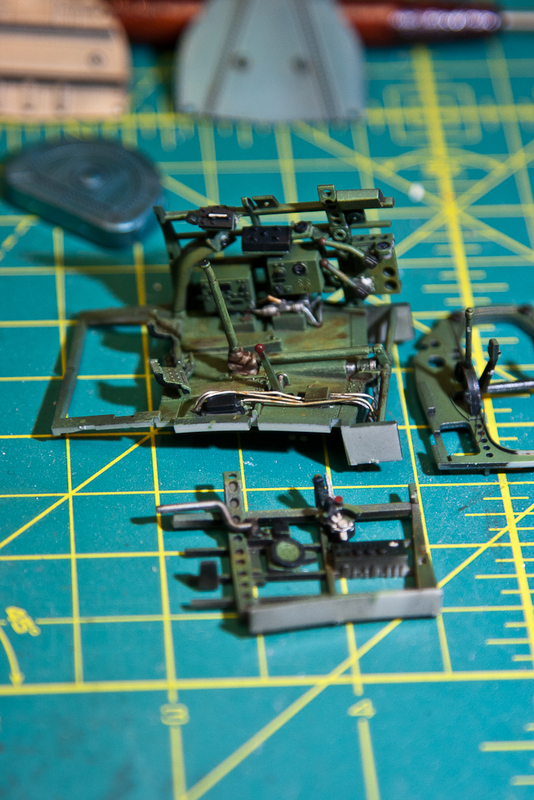 4) - Then I use Tamiya Smoke (yes, yes, I know - it's 1997 all over again) and spray all of the interior parts. This one single step accomplishes several things - 1)It's our gloss coat which we would normally apply as a step unto itself. This protects the current paintwork from any enamel based washes and allows us to decal on a smoothe surface. 2)It works the same way as a traditional black 'wash', but I prefer this method because when you apply this colour and leave the parts in the orientation that they're supposed to be in (ie vertical for bulkheads) the paint naturally moves to create shadow thanks to our good friend gravity. 3) and this is the big bonus - it acts as a filter, which is actually the opposite of a wash, it unites all of the colours. It creates extra contrast, but merges all the colours by giving them something in common. 4) you can let it/make it puddle a little to imply a grime or stain. I've tried to demonstrate that with this photo - the top half has a crude black filter applied, you can see the yellow lines on the mat are much brighter and the tan belt doesn't stand out so much on the seat. 5) - This is new to me, but I try to blend some oil paints into the larger surfaces, ochre and brown or grey. I'm still working on this part and this is only the second time I've tried this, but I like where it's going. 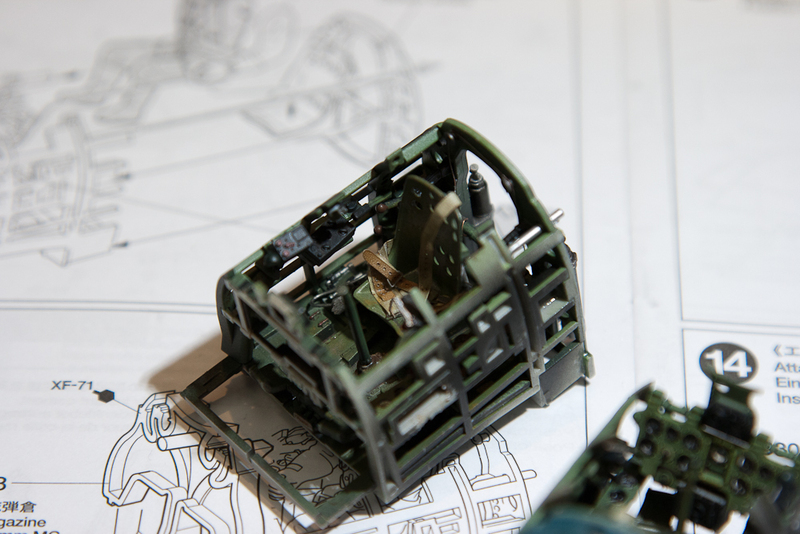 You may have noticed in the previous post that some of the areas appeared pretty stark - in the event that this happens, I'll apply a thinned spot layer of the base colour of the cockpit to tone it down a bit. ****I do this at this point because it only works on a gloss base, and if I applied the Tamiya smoke now, the contrast would be outrageous. 6) - Matt coat. I have heard great things about the Vallejo matt and gloss so I tried the matt, and I loved it. Easy to work with and came out perfectly flat. Enough of the chat - on with the photos! 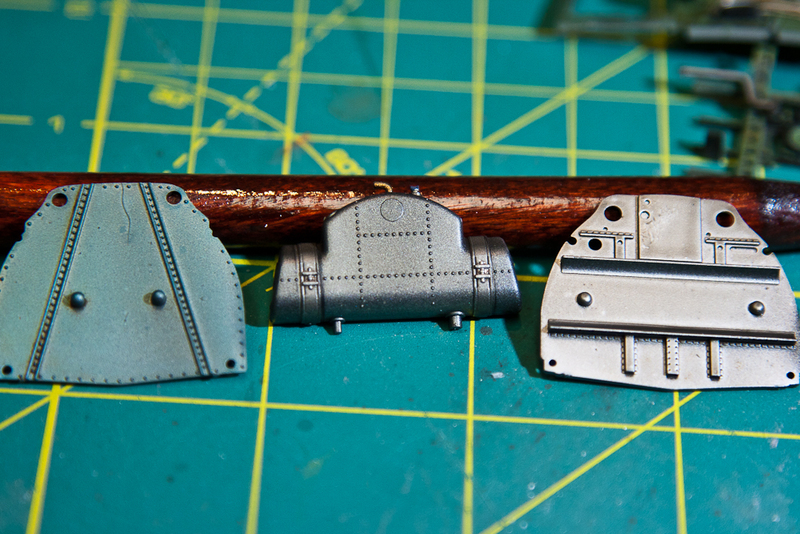 The coat of smoke is subtle, but it's there - look to the rivets on the seatback and the holes in the belt for proof. It has also toned down the metal buckles for a better scale appearance. The fit is just as good as ever. Look what the smoke has done to the boot at the base of the control column. I love this stuff. 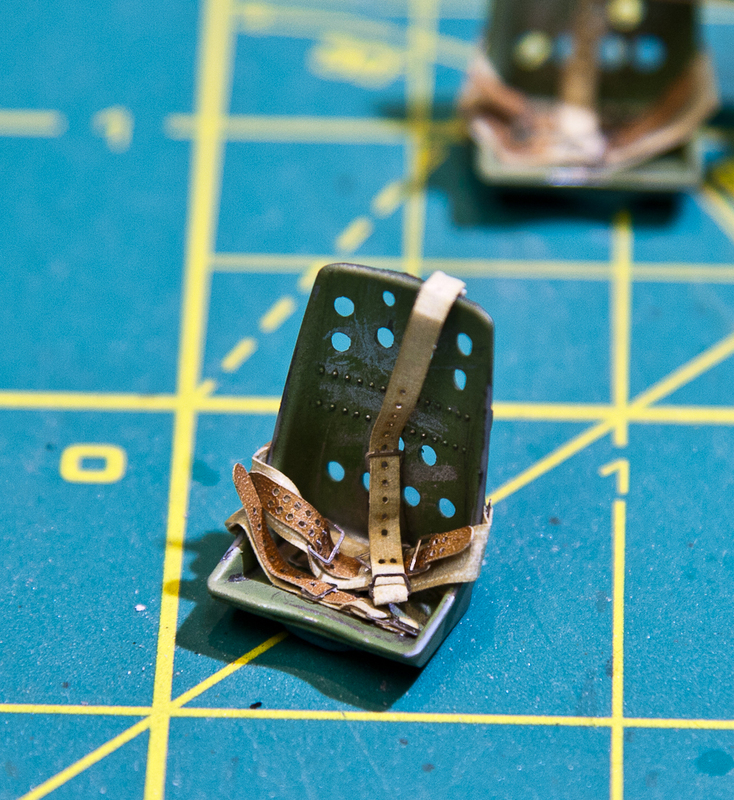 Smoke applied - you can see I let it puddle on the A6M5 firewall. The tank in the middle is actually three shades of metal, all tied together now by the filter. The tank, straps and the fasteners that tighten the straps are each a different colour. It's more pronounced than the photo would lead you to believe. Like so. 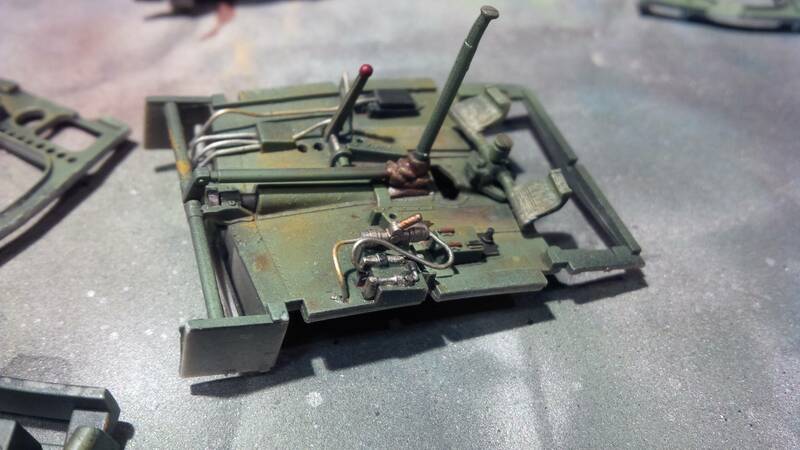 Note the 'wash' effect from the Tamiya smoke. 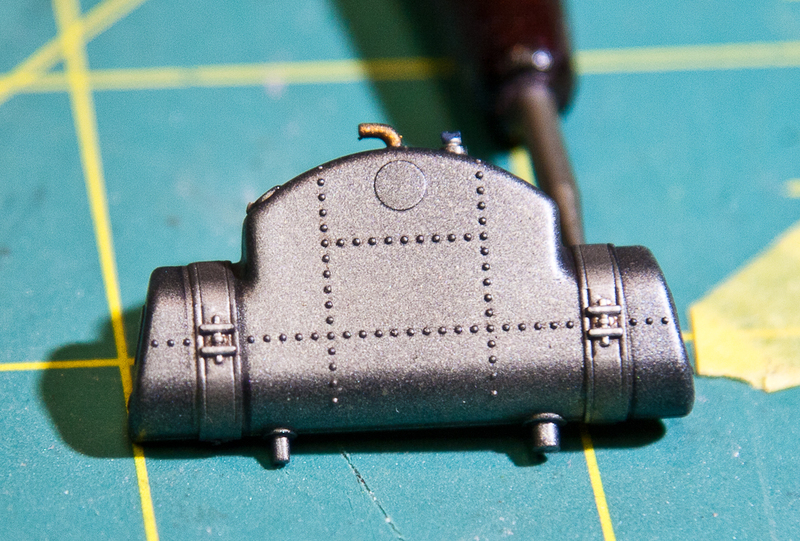 The circle is raised - it's not an ejector pin marking, but rather an actual detail on the real tanks. Finally! We're building in three dimensions! I have real parts! The different paints used on the tank are much more apparent here. Here are the rest of the photos, scroll through them, then look at them a second time and pick out the areas where you can see the smoke wash/filter, the oil highlighting/wear and some metal chipping (hairspray technique). A place for everything and everything in its place. Thanks as always for all of your support folks! I've started to make up a jig for the Rufe, that's another new experience for me. Fun fun. Beautiful work on the cockpits Matt, they look great. I may have to try the oil paint technique; right now I only use artist oils to paint the faces of figures and to add highlights and shadows on them. Exactly the same idea. I touch a toothpick to the paint and apply a spot roughly where I want the lightened patch to be and then I use an old brush with worn stubby bristles to move the paint around. I put a dab of oil paint on a piece of cardboard and let it sit for 10 minutes to draw the linseed oil out. I read this somewhere, I'm not sure that it's necessary, but it doesn't seem like a bad idea. Hi Matt, that is what I thought. I have used artists oils for the "dot technique" to simulate weathered surfaces in the past. It never occurred to me that they would be an excellent tool for highlights and shadows as well. I can be a bit obtuse at time. Both cockpits are your usual 1st class effort, and certainly look the part. for weathering washes I use Model Master enamels rather then artist oils. I can even do the Dot method with them. Works great, and I don't have to leach out the linseed oil as I did with the artist oils. Apparently, the Linseed oil is one of the main elements in slowing down the drying time to an absolute crawl. I have Tamiya's acrylic smoke, and Alcad's smoke that just might work as a filter, at least that was my hope when I bought it, but haven't tried it out as yet. for weathering washes I use Model Master enamels rather then artist oils. I used to use standard enamel paints, but the advantage to oils is that you can use a much milder thinner. That way I don't have to worry about the coat underneath. Hi Matt and Joel, I paint a lot of figures from 1/48 - 200mm and my weapon of choice for them is artists oils. I have learned several things about using them over the years and speeding up drying time is one of them. I use Windsor & Newton oils because I like the finely ground pigments. Many artists feel that that line also dry a bit faster than others due to the fineness of the ground pigments. Following are a few things I have learned about using artists oil to paint scale model figures. Your choice of solvents as painting medium ingredients affect drying times. Oil Of Spike = very slow drying. Odorless Mineral Spirits = a bit faster drying. Distilled Spirits of Gum Turpentine or Turpenoid = fastest drying. Your choice of drying oils affect drying times: Walnut Oil = slower drying. Linseed Oil = faster drying - I know many folks think Linseed Oil is the cause of slow drying times, but it actually is the faster of the two oils above that are found in artist paints. The oils are used when the paint is manufactured and different brands us one of the two different oils above. Another way to speed drying time is to let artist oils sit on a folded paper towel for an hour or so before your painting session. This will leech a fair amount of the oil from the paint and may halve the drying time as a result. Finally, I have made a drying box. This is simply a shoe box, lined with lint free cleaning cloth and a hole cut in the box top. I stick a 60 watt bulb through the hole and viola a drying box. I have found this dries any oil applications I have made overnight. But, above all, the thinner application of paint (no matter what painting medium, or paint you choose to use) the faster the drying will be. This of course works to our advantage as modelers as we invariably paint in thin layers. 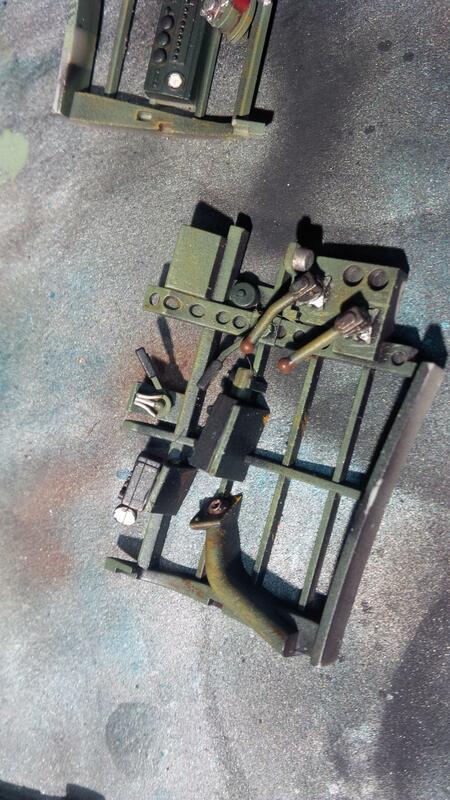 ^^^Exactly why I paint Tamiya paints thinned with their own lacquer thinner. QUICK TIP; want to avoid the carpet monster? 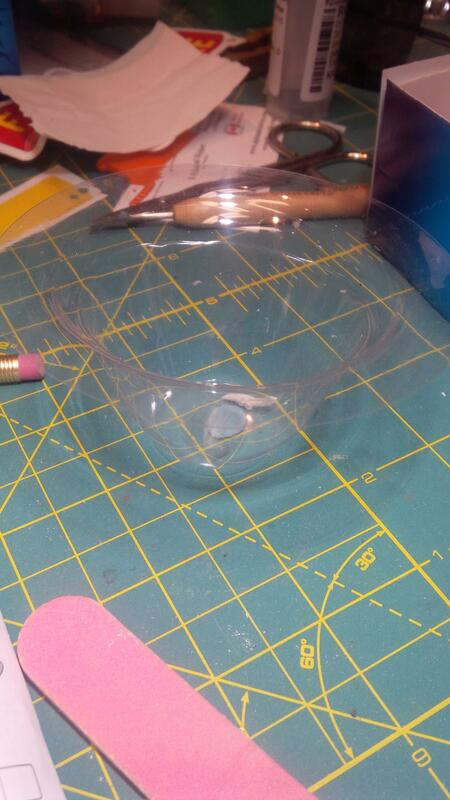 Use a small clear plasti bowl (I think this was in a package with lightbulb or something similar.) all the small parts I cut off go in here, and I use blue tack to secure it so I can necessarily send them all flying across the hobbytable. Great tip Gary, unfortunately most of my carpet monster incidents occurs when I squeeze the tweezers too hard causing the part to fling off into the unknown. I use Mr. Color lacquer thinner for airbrushing my Tamiya paints - I can't find Tamiya's lacquer thinner here in Germany. I find this makes the paint airbrush even smoother and it seems to be a bit tougher once cured. Great tip Matt, unfortunately most of my carpet monster incidents occurs when I squeeze the tweezers too hard causing the part to fling off into the unknown. Likewise, Gunze is no longer imported into Canada, so we can't get the Mr. Color line here. 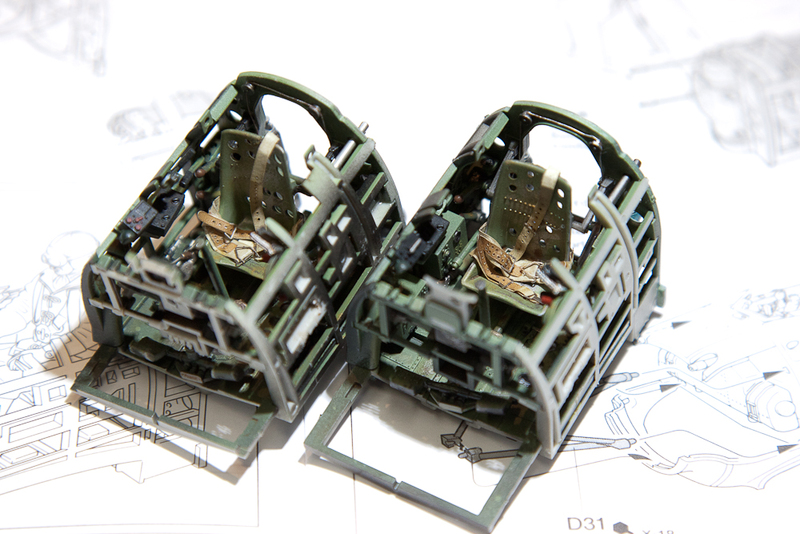 The same result is achieved with Tamiya's own lacquer thinner. You sure know you stuff about artist oils. I've tried them, and still use them every so often. It's just that for washes I find that Model Master enamels thinned with their own brand of Mineral Spirits works well for me. Like Ernest, 9 out of 10 run ins with the Carpet Monster is from over handling small parts with tweezers, which results in said parts vanishing only to be found several model builds later. 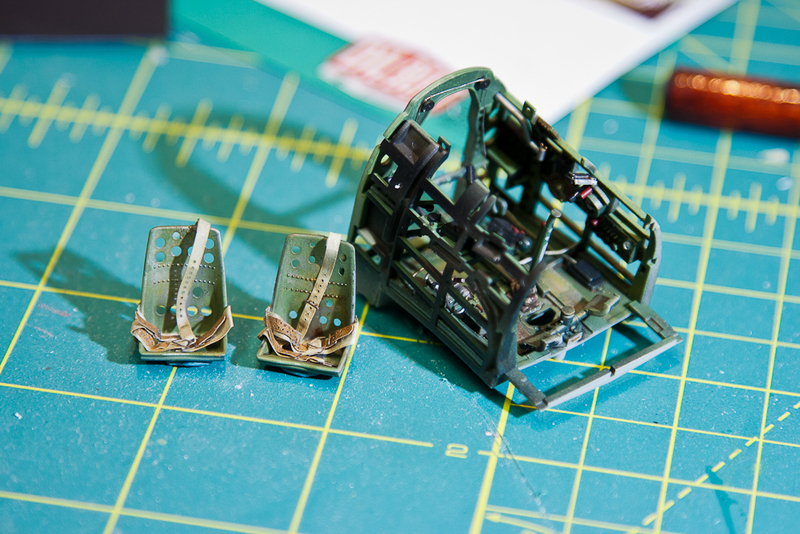 The converted A6M2b fuselage is totally assembled! It fit as well as I could have hoped, but will need a fair bit of putty. Touching base with Mal to try and get a set of masks worked out! Waiting with anticipation to see the end result, which will undoubtedly be beautiful. I can't remember where I left off, but the cockpits are done, the cowl mounted guns installed completed with Master Barrels - I love these things. 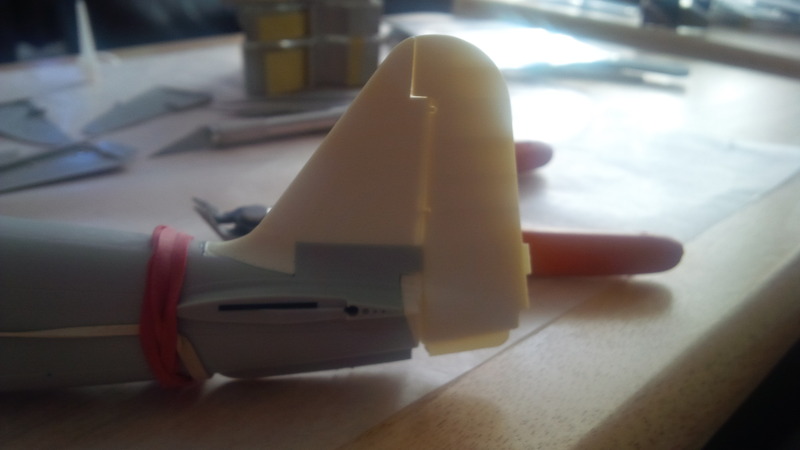 The biggest achievement has been the tail for the Rufe - it's a 5 part converstion and involves some nasty cuts. The fit was pretty good. 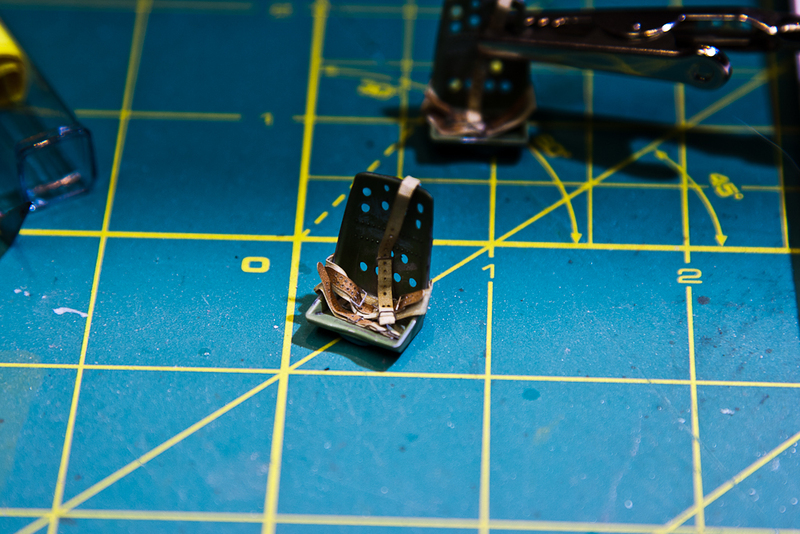 Some of my parts had shrunk, but Bob from MDC had replaced a few and I didn't want to bother him for any more. 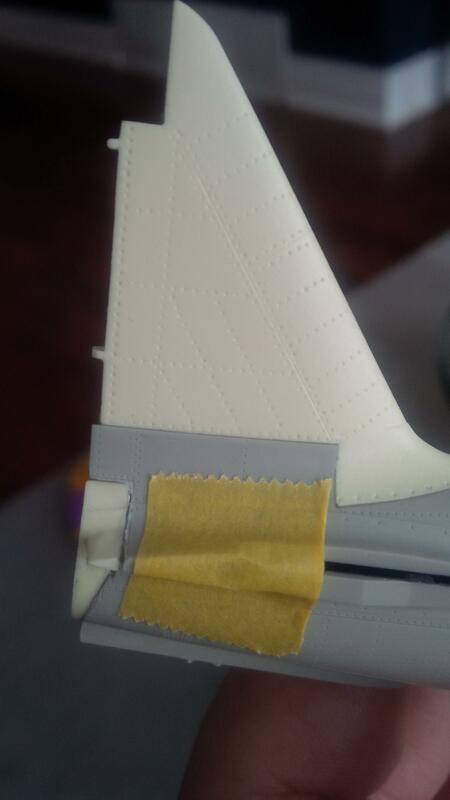 This isn't a cutout at all - this is where the tail hook usually goes. 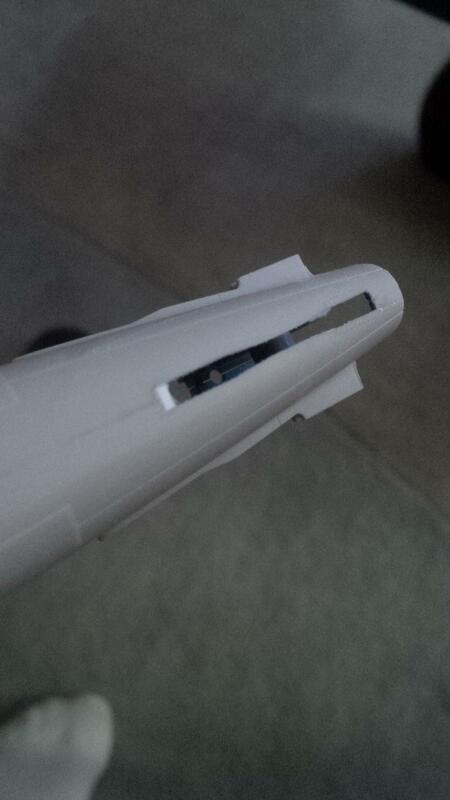 The Rufe has a fin on the bottom of it's fuselage. MDC provides the fin that is on the bottom of the plug for this hole. The plug was too small for mine - which is weird because it's a set size on the kit, not a miscut by me. I didn't want to glue a shim to the plug because it would have been end to end like - to - and there wouldn't be much of a gluing surface. 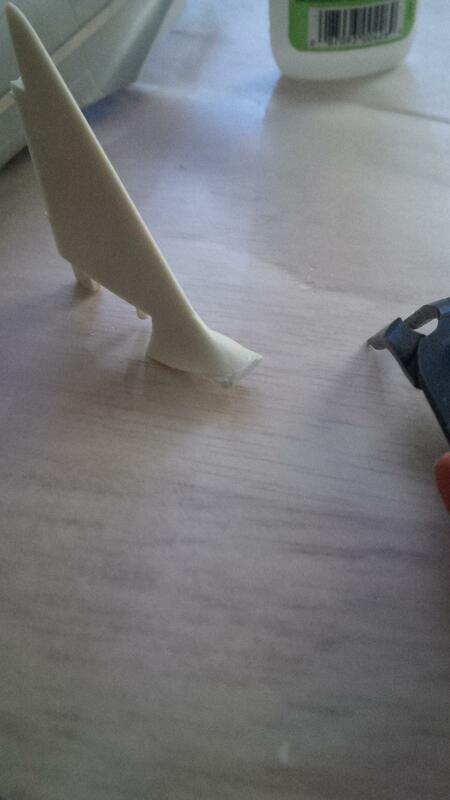 So instead I found a sheet of styrene the thickness of the gap, cut a steep triangle and stuck it tip first into the fuslage - this made sure that it was the perfect size in length (thickness of the sheet) and width. 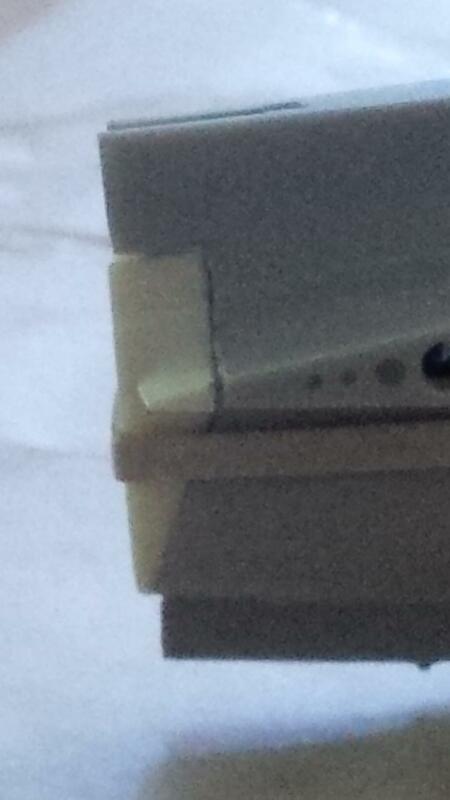 The added advantage is that I cut and sanded it flush and it was face to edge for gluing. The end of the tail. The Rufe has a full height rudder, as opposed to the Zero's rudder which ends just below the horizontal stabs. 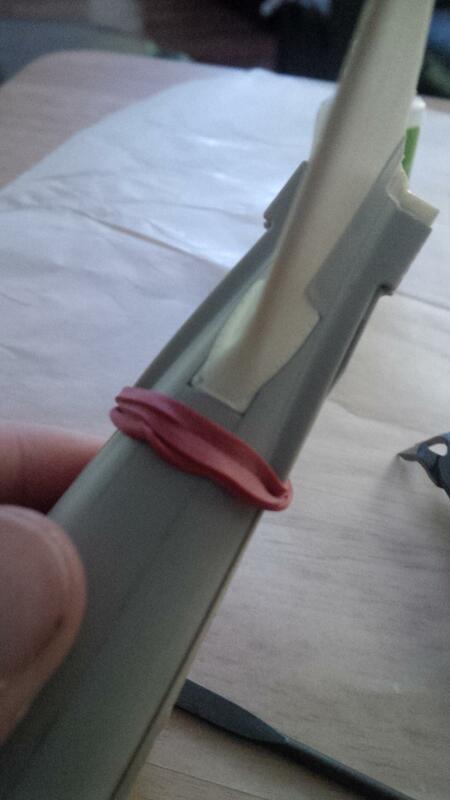 You have to cut the tail off the kit and replace it with this plug. This part shrunk considerably and I had to mix some 2 part epoxy to build the part out and flush. Lots and lots of time spent sanding, fitting and sanding and fitting - just a few strokes here and there managed to get the tail fitting pretty well. I knew I would need putty, but that's expected in any conversion. 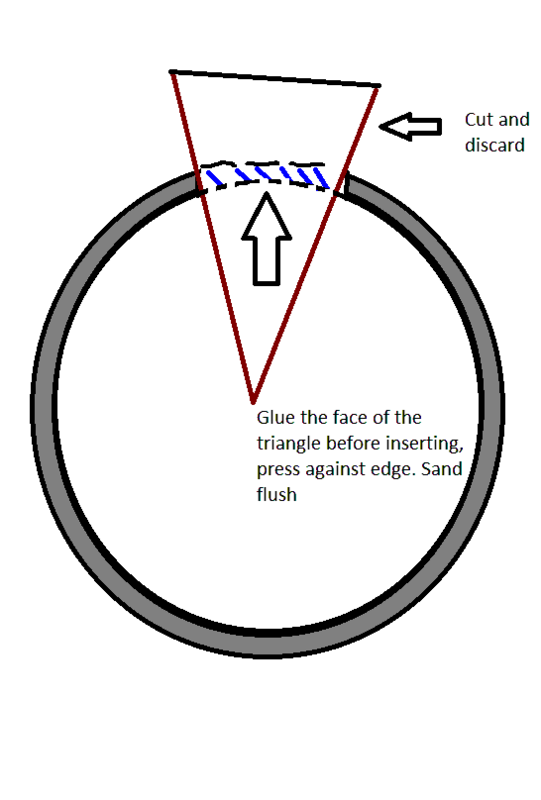 The elastic running length wise was originally looped around the tail plug, holding it in place while the Zap cured. The tails fits very nicely - it just took a fair bit of work to get it here. 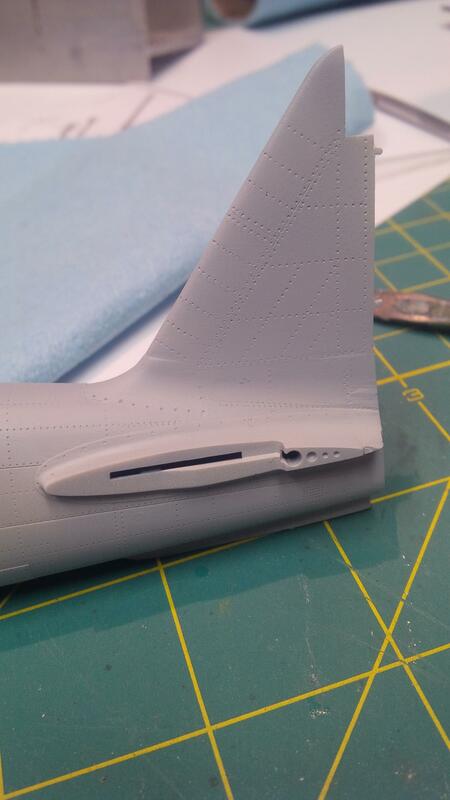 The tail plug on the other hand.... and this is the GOOD fitting side. I WANT TO MENTION that the fitment issues are not the fault of MDC, my parts had simply been an early batch and had shrunk. The new parts I received for the wing fit much better (touch wood). Puttied, epoxied, sanded and sanded and....primered. I'm really happy with how it has come out so far. You can see a few spots that need attention still - I'm already on it! Overall, I'm really happy with the conversion set and am looking forward to doing the wing. The tail unit looks darn good Matt. You came up with some well thought out fixes for the fit issues that came up and they worked out very well. I always look at any major resin sub-assemblies that I do with a bit of foreboding before I begin work, as construction very often entail what you just did. I don't mind a good challenge during a build, but occasionally major resin fits go a bit beyond that. Thanks Ernest. I'm very happy with how it turned out after the initial application of putty and primer. I just touched up some of the smaller blemishes. I'm not nearly as nervous about the wing to float join now. I'm only worried about pinning it and trying to align it.